Melissa Manchester (born: February 15, 1951) is an American singer-songwriter and actress. 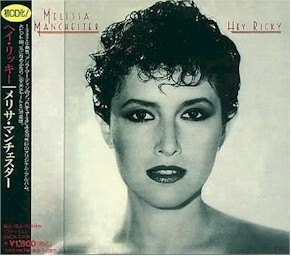 Hey Ricky is the title of the tenth album release by Melissa Manchester released in April 1982. Her debut album "Home to Myself" was released in 1973. * Only this song contains music of Vangelis (from the main theme of "Chariots of fire). Note: Vangelis does not play on this song. Copyrights is owned by: Spheric B.V.; Tougknot Ltd. and Warner Bros. Music Ltd; ASCAP. Lyrics taken from sleeve of LP. Lyrics transcribed by Robert Eichelsheim and Henk Engelen. Thanks to Don Fennimore for the scan of the album sleeve.